In this paper, the optical properties of titanium nitride split ring resonators as an intermetallic metamaterial nanostructure were studied. Our simulation shows the presence of plasmon and LC resonances in the transmission spectrum of a cell consists of four u-shape split ring resonators. The effect of different parameters of resonator such as size, periodic constant, and the material between arms in addition to the polarization of incident beam was examined on the resonance behavior of the system. Also, the optical properties of a cell consist of four complementary split ring resonators within titanium nitride thin film were investigated. An excited mode was observed at λ = 840 nm that was attributed to the plasmon resonance. 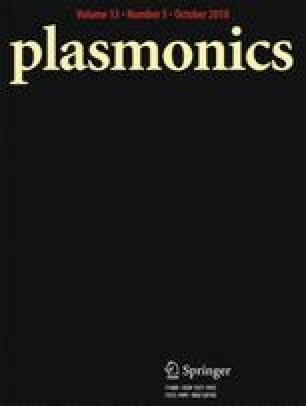 Changing the arrangement and configuration of the system from C 1v to C 2v symmetry led to the presence of the LC mode beside the plasmon mode in the transmission spectrum. Also, we explored a connection between the complementary split ring resonators and orderly perforated surface plasmon systems. It was determined that a transition occurred from resonator-type to surface plasmon behavior by increasing the size of resonator above 170 nm.